Democrats credit health care with their gains in the 2018 midterms. One week after his administration sided with a court ruling arguing for repeal of the entirety of the Affordable Care Act, President Donald Trump said Republicans should wait to vote on a plan to repeal and replace President Barack Obama's signature legislative achievement until after the 2020 election. "The Republicans are developing a really great HealthCare Plan with far lower premiums (cost) & deductibles than ObamaCare," Trump tweeted Monday evening. "Vote will be taken right after the Election when Republicans hold the Senate & win back the House. It will be truly great HealthCare that will work for America." The announcement appeared to shift the goalposts after the president spent a week rallying Republicans to make health care a signature issue in their 2020 campaigns. 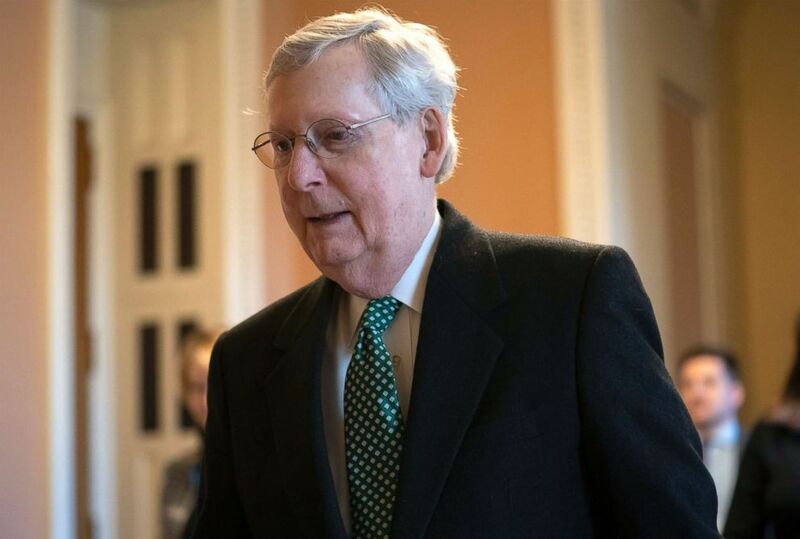 (J. Scott Applewhite/AP) Senate Majority Leader Mitch McConnell walks to the Sebnate chamber at the Capitol in Washington, March 14, 2019. Senate Republican Leader Mitch McConnell claimed on Tuesday to be the driving force behind the president's decision to delay a legislative showdown over health care, saying he had a phone call with the president on the issue Monday. "We had a good conversation yesterday afternoon ... I made it clear to him that we were not going to be doing that in the Senate," McConnell told reporters. The Republican Leader told reporters that he reminded the president of "Senate Republicans' view on dealing with comprehensive health care reform with a Democratic House of Representatives," and that they had been unable to achieve health care reform during the last GOP-controlled Congress. "As he later tweeted, [the president] accepted that and that he would be developing a plan that he would take to the American people during the 2020 campaign and suggests that that's what he would be advocating in a second term if there were a Republican Congress," he said. But President Trump denies that McConnell swayed his decision to punt the matter until after the election. “No, I want to delay it myself, I want to put it after the election," Trump said, going on to explain his thinking in delaying a legislative fight in hopes that Republicans will be able to regain control of the House of Representatives in 2020. “What happens is, we'll go through the election, we have a very good chance at retaking the House. We have a very good chance at keeping the Senate, I think we will keep the Senate, and I think we're going to keep the presidency, and we'll vote in the best health care package we've ever had,” Trump said in Trump said in explaining his thinking. Democrats largely credit health care as the issue that paved the way for their gains in the 2018 midterms that led to the party retaking the House of Representatives. At President Trump's urging, the Department of Justice just one week ago weighed in on an ongoing court fight potentially imperiling the Affordable Care Act, siding with a conservative judge's ruling that the entire law should be struck down as unconstitutional. That lawsuit could reach the Supreme Court as early as 2020. According to ABC News' exit polls from last November's midterms, 41 percent identified health care as the primary issue that drove them to the polls, with voters trusting Democrats 57-35 percent over Republicans in handling of protections for pre-existing conditions.